The next day we went back to Brighton and visited a wonderful second-hand bookshop with plenty of old, old books. Naturally, I headed straight for the children’s section and it was there that I made The Discovery: My Mates and I, by a Mrs. O.F. 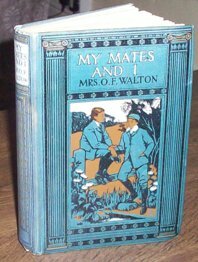 Walton and published by the Religious Tract Society. According to the British Library it was written in 1870 – although published later – and is by all accounts a terrible, terrible book… from the absurd title and woeful characterisations to the paper-thin plot which barely makes any effort to disguise its Jesus-leanings. I just had to buy it. And now, in what I anticipate will become an irregular feature, I would like to inaugurate the first in a new series: The Wit and Wisdom of My Mates and I. Having received expert spiritual guidance at the house of old Mrs. Payne, the lads depart and soon find temptation… “just outside we met with a number of our companions, who were talking and laughing at the top of their voices, and who wanted us to join them in a noisy game. However, with Mrs. Payne’s words ringing in our ears, Frank and I refused, and went quietly home; though I am sorry to say our two mates were over-persuaded, and left our company for theirs”. This books looks like a total gem! Can’t wait for more wisdom!!!! I’m just seeing gay innuendo. The front cover, the "noisy game" with mates, "Frank and I went quietly home" …. ah, bliss. Give us more! Woops: "The Wit And Wisdom Of My Mates And I" is an egregious solecism. How should we rephrase it to follow the received grammatical style? "The Wit And Wisdom Of Me And My Mates" or "The Wit and Wisdom of My Mates And Me"
I think I’d go for "My And My Mates’ Wit And Wisdom"